will consider selling 80% ownership in the mine if the buyer has the funds to put the mine in production and use the owner's underground contracting company. Prescott, Arizona (central Arizona), USA. The current owners have invested $1.1 million to perform this work and maintain the 19 claims. Wish to sell the mine outright for $1.4 million. The owners are open to selling 80% of the mine to someone who has the capitol to put the mine into production and use the owner’s Underground Mining and Contracting Company to perform the mining. 1300/oz, likely to go higher. Two Geological tests performed. Full results available upon request. The Paystreak Mine is an underground mine with good gold and silver values. It is located in Arizona in the Prescott National Forest, which is a historically rich gold mining area. 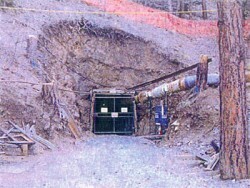 Because the vein was clearly visible at the surface and testing showed commercial grade ore, the present owners decided not to engage in a drilling program but instead they extended an existing portal tunnel through the mountain and back to the vein 850 feet at a depth of 300 feet below the surfaced vain on the mountain. The vein was successfully intercepted and drifting on the vein was preformed with even better assay results of .6 opt gold. One geologist estimates that there is at least 50,000 tons of good ore to mine and a drilling program would likely confirm much more. The owners have available a detailed proforma that show a full recovery of the total investment needed to both purchase and operate the mine ($3.66 million) can be achieved in Year 2 plus a $2.2 million Gross Profit! The Paystreak Gold Mine is not available at this time.